I have dragged my feet a little bit about building this website, because I don’t claim to be an expert on anything, but have had a lot of life’s experiences that have taught me a lot and wanted to share those ideas with you. This is a website in progress so be sure to check back often. 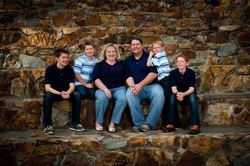 I am the oldest of 9 (lots of girls), went through some challenging years as a teenager, attended college, served on an Institute Council, chose to serve an LDS Mission, returned home to continue attending college, married a great guy, had endometriosis with concerns of whether I would be able to have children and blessed with 4 boys. My work experience started as a very young teenager working for my dad in his construction business. With one small son my husband and I managed apartments. Then as our family grew we owned and managed a bakery for 5 years. When we closed that I was able to work from home for a company doing collections. Along the way I have done many at home businesses. From working my way to Director as Mary Kay after a year of being in the business, to Story Teller Flannel Boards, Usborne Books, Discovery Toys and currently actively doing Pampered Chef and Scentsy. Over the years I have had the opportunity to serve in Relief Society Presidency’s, Nursery, Activities, Enrichment Leader, Relief Society Teacher, Sunday School Secretary, Newsletters, currently serve as Cub Scout Den Leader and love to help wherever I can. With having 4 children I have found a lot of joy in volunteering in the community and helping with the PTA. I have had the opportunity to serve as PTA President for 2 years. I have loved helping with wherever there is a need at the school and currently serve on Council level. Besides that we have a fun family life that is full of life’s lessons. Good days, bad days, messy house, crazy schedules, unemployment off and on since August 2008, sports, family hobbies of racing, wanting the best for my boys, wondering if I am teaching them all that I can and if I am doing my best. Wondering about illness and a balance of spoiling, having fun, providing for their needs and which wants do I take care of. Building a relationship with my husband and feeling like life is good and then figuring out how to deal with days of stress. I hope you will find fun, answers, share your thoughts and ideas and together we can find sanity for mom’s.